Putin foe Navalny freed from jail after back-to-back sentences - Integration Through Media ....! MOSCOW, (AFP) – Russian opposition leader Alexei Navalny was released from jail Sunday after three weeks behind bars for organising anti-Kremlin protests, his second spell in detention in as many months. The 42-year-old activist left a detention centre in the south of Moscow in the early hours of the morning and spoke briefly to journalists before leaving in a waiting car. “If anyone thinks that with arrests… they can scare or stop us, that is clearly not the case,” he said after thanking those who supported him. Authorities have turned up the heat on Vladimir Putin’s top foe since the Russian president’s approval ratings took a beating over deeply unpopular pension reforms. The Kremlin critic finished a 30-day sentence in September for organising a rally at the start of the year, but was arrested as soon as he was released to face further charges over another protest. The latter demonstration, against the raising of the retirement age, was time to coincide with regional elections last month. The Kremlin suffered rare defeats in those polls, with voters rejecting candidates from the ruling United Russia party in at least two regions. A run-off in the far eastern Primorsky Krai will be held again in two months after accusations of vote-rigging in favour of the Moscow-backed candidate led to protests. Navalny ally Leonid Volkov said at the time of the latest arrest that the Kremlin had “to take it out on someone because of all their defeats and failures of the last weeks”. Supporters fear that the two consecutive administrative cases mean the authorities may be getting ready to open a criminal probe against Navalny. In that case he could face a lengthy prison term. 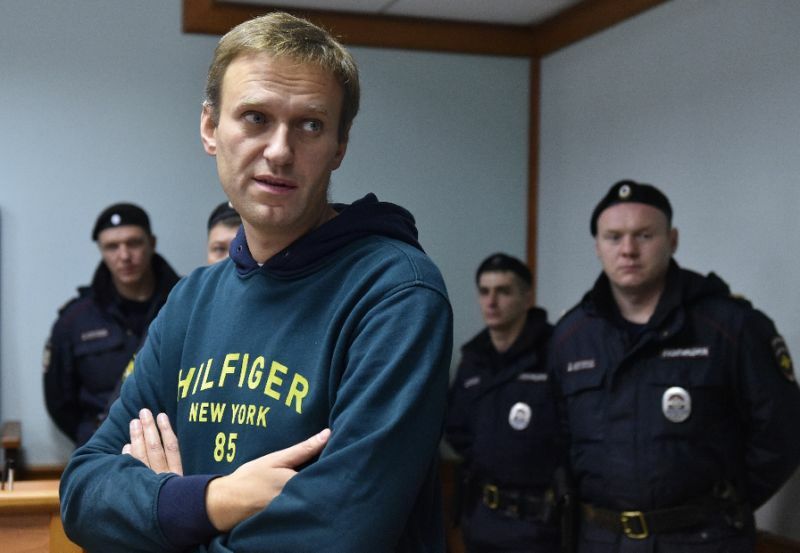 Amnesty International described Navalny as a prisoner of conscience and said he had committed no crime. Navalny came to prominence as an organiser of huge anti-Putin rallies that shook Russia in 2011 and 2012 following accusations of vote-rigging in parliamentary polls. His anti-corruption rhetoric is especially popular with younger people who follow his online channels and blogs. Since his most recent jail term his 17-year-old daughter, Daria, has launched her own Youtube show called “Voice of My Generation”. Navalny was barred from running against Putin in a presidential election in March. He served a month in prison in the summer after organising demonstrations ahead of Putin’s swearing-in ceremony for a fourth Kremlin term. The Yale-educated lawyer has faced a string of charges and attacks since he became the leading opposition figure in Russia.